Swarm of Bees Removed From Williamsburg Street: Williamsburg was abuzz yesterday, but not anymore. A beekeeper removed a swarm of 24,000 bees from Montrose Avenue yesterday. DNAinfo has the story. 6 Shots of the Demolition of Cherry Street Pathmark: They came in like a wrecking ball! They’re clearing out the Cherry Street Pathmark to make way for Extell’s 68-story tower and Bowery Boogie has the shots to satisfy your inner longing to break things. A Look at Apple’s First Attempt at the Smartphone: While some of us spent the ‘80s wearing side ponytails and moonwalking across our kitchen floors in our socks, Steve Jobs was hard at work envisioning the future. Gizmodo gives us a look at some of those visionary items. Spielberg Selling East Hampton Home for $24.5M: 6 years after purchasing the teardown, the Academy Award winning director is putting the property on the market. New York Post has the details. Stylish Bathroom Accessories for Baby Boomers: Fastco. 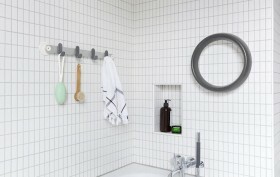 has the scoop on bathroom accessories that will accommodate the needs of the aging baby boomers, without cramping the millennials’ style. Video Yelp Reviews Coming Soon: Soon enough we’ll have even more ways to get everyone’s opinion. You can be the judge on whether or not that’s good news. But until then, Engadget has the details. Ed Scheetz Renaming Hotels: The Real Deal has more on the story of how the hotelier is renaming his King & Grove chain.